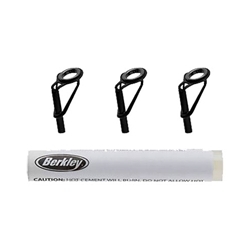 The Berkley Guide Tip Repair Kit is the perfect thing to keep in your tackle box for the on-the-go tip repair. Kit includes Quick dry cement and 3 tip sizes: 1-Small 6/64", 1-Medium 7/64", and 1-Large 8/64". This kit is perfect just in case you need a quick fix during a tournament because it can take you 1 minute or less and you will have a new tip on your rod!